London, 1958. It's the eve of the sexual revolution, but in Juliet Montague's conservative Jewish community where only men can divorce women, she finds herself a living widow, invisible, Ever since her husband disappeared seven years ago, Juliet has been a hardworking single mother of two and unnaturally practical. But on her thirtieth birthday, that's all about to change. A wealthy young artist asks to paint her portrait, and Juliet, moved by the powerful desire to be seen, enters into the burgeoning art world of 1960s London, which will bring her fame, fortune, and a life-long love affair. I read Natasha Solomons' The House at Tyneford last summer and absolutely fell in love with it. Something about the writing just captured me - I had so many quotes and phrases underlined. 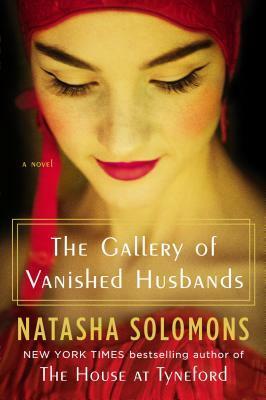 So, I was really excited when I spotted Solomons' new book, The Gallery of Vanished Husbands, on NetGalley. The cover is eye-catching and lovely, and the description sounded so unique. It's not a setting or time period that I've read much about, so I was really curious about it. The Gallery of Vanished Husbands tells the story of Juliet Montague, a mother of two living in London. As part of a conservative Jewish community, she's expected to live a certain way. But there's a problem. Her husband, George, disappeared one day and hasn't been heard from since. She's a woman caught in transition. She's no longer single, but she also hardly counts as married. The leaders in her community make a decision - she must live as if she's a widow because only her husband can initiate a divorce. Juliet decides to do as she's told. She works hard in her father's store to support her children, and she remains practical to her core. She's saving up money to buy herself something useful for her thirtieth birthday, until she's struck one day by the desire to do something different. She spots a piece of art that she wants to call her own, and she's willing to spend all she's saved to purchase it. The artist is unwilling to sell because he wants to paint Juliet's portrait instead. This one small decision, having her portrait painted, thrusts Juliet into an entirely new world. While she is not artistic, she has a critical and judicious eye. She knows good art when she sees it, and this skill helps her enter the London art scene. The entire book centers around Juliet's life, including her love for art and her rebellion against the conservative community that wants to dictate her actions. While I liked the idea of the story, there was just something lacking for me in the execution. Solomons' characters were unique and well-developed, and the writing was still descriptive and evocative. My problem? I trudged through most of this book. I love books with a slower pace, but this one was really a struggle for me at times. It didn't feel like there was any build-up or conflict leading to a climax and resolution. While there are certainly conflicts along the way, there wasn't any excitement or passion in the story. For a book that is focusing on a woman who is fighting against her upbringing, I found it frustrating that the book lacked that depth of feeling. I wasn't very invested in Juliet's story, and the whole thing was just a little lackluster. As much as I love the title, I even thought that was a bit misleading. The disappearance of Juliet's husband helps spark her rebellion, but it's not really a crucial element of the plot. The phrase comes from a section in the newspaper that prints the photos and descriptions of husbands who have run off in the hopes that someone can tell their families where they've gone. It seemed like such a minor element to me, especially considering the fact that book focuses much more on a collection of portraits of Juliet (every artist she works with ends up painting her somehow). It's not about the fact that her husband has vanished - it's about a woman who has lived in the shadows finally coming into her own. The Gallery of Vanished Husbands is the story of a woman who dares to be different, to be bold and to choose her own future. While I was disappointed in the pacing, the writing was descriptive and the focus on the art world was intriguing. I wanted a little bit more from the story, but it was still an enjoyable read and offered a new perspective that I haven't read heard much about until now. "... she could feel the tug of the invisible chain tying her to George. He mad her not quite respectable. While Juliet no longer had an interest in respectability, she wanted to select the method of her own notoriety." *I received a copy of this book from Penguin/Plume in exchange for an honest review. I was not compensated in any way for this review. Ok, this cover is so beautiful and I love the synopsis of this book. I've heard of The House at Tyneford and I even know that you loved it, but I can't remember what it was about! Despite your small reservation about it, I think I'm still interested in it and I think I'd love to give this one a try at some point when I get a chance. That cover is CALLING ME. And I like that this gal wants to find her own way. This is a great review, Hannah. Isn't that cover just gooooorrrrrgggeeeouuussss? That's totally why I wanted to read it. Well, that and the fact that I loved her previous book. The House at Tyneford was set during WWII - about a Jewish woman who had to take a job in England in order to escape persecution in Austria. I would love for you to give this one a try! I really did enjoy it - it's definitely not for everyone, but I would be so interested in discussing it with you. I really like the fact that this one has an art aspect to it. Plus, I do like the fact that this is a girl who takes charge of her own life after years of following what others have told her to do! It seems like the kind of book that would definitely interest me, and I certainly hope I get the opportunity to read this one. What a bummer! This one sounds like it has SO MUCH potential. It's disappointing when you can feel it leaking off the page, but it never materializes into anything great. I love art themes, and the cultural context of Juliet's Jewish community sound fascinating, especially within London in the 1960s. But I'm not sure I want to attempt this book if it doesn't live up to expectations. I don't know if Asheley has mentioned it to you, but we both just finished reading MARGOT by Jillian Cantor which is about a Jewish woman in American in 1959. Clearly the stories are vastly different - since that is a re-imagining of history as if Margot Frank lived. BUT it is an incredibly moving story, that was far more relevant than I ever imagined. Anyway, I think you should put it on your radar if it isn't already. Okay, so if you're really intrigued by the description, I'd definitely recommend trying to find it at the library. I'm not a huge art lover, so I know that may have affected my feelings on it. I wonder if you might enjoy it more if you're interested in the art world in particular! It may not have lived up to my expectations, but that could be because of the connection I felt to The House at Tyneford. Keep me updated if you do end up reading it! Being that this takes place in London and the main character is Jewish really intrigues me. Although knowing you review, I'm not sure how much I'd actually enjoy it, so it might be a while before I finally decide to pick it up. Yeah, I wondered if this one would really appeal more to people who were really interested in those aspects. I wanted to read it more because of my previous experience with the author than because I liked the summary. I'll definitely be interested in your thoughts if you end up reading it at some point!